The guessing game of what name Google is going to call its much anticipated mobile operating system Android L might finally be over, with a Google engineer accidentally confirming that it will be called Android Lollipop after all. The latest hint that Android L will be named Android Lollipop appeared in an unexpected place; a screenshot posted by a Google developer in the Chromium issue tracker. The screenshot contains a debug icon of the Android Robot on a stick, perhaps the strongest hint yet that the new version of Android will be named Lollipop. Google has since removed the page where the screenshot was listed. Pages on the issue tracker are usually left up to help developers iron out bugs before new software is released, so the fact that the page has been taken down might point to Google not wanting us to see what the page contains. 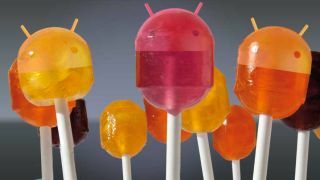 We've had our suspicions that it might be called Android Lollipop for a while now, with Google recently releasing a photo of a cake topped with lollipops. Since then there have been suggestions that it could be named Android Lion and most recently Android Licorice, amongst other confectionery-based names beginning with the letter 'L'. Meanwhile the Android YouTube channel released a new video that confirms that Android L will be Android 5.0, ruling out the possibility that there would be an Android 4.5 release. In the video a number of people dressed as 'L' themed sweets, including lemon meringue pie, lava cake and lady finger, nervously wait to be cast as Android L.
These sweets have all previously been rumoured to be Android L's real name. Interestingly a person dressed as a lolipop does not appear, perhaps they are already in the casting room? We might not have to wait too long to find out what the final name of Android L will be, with a possible release date mooted as November 1.